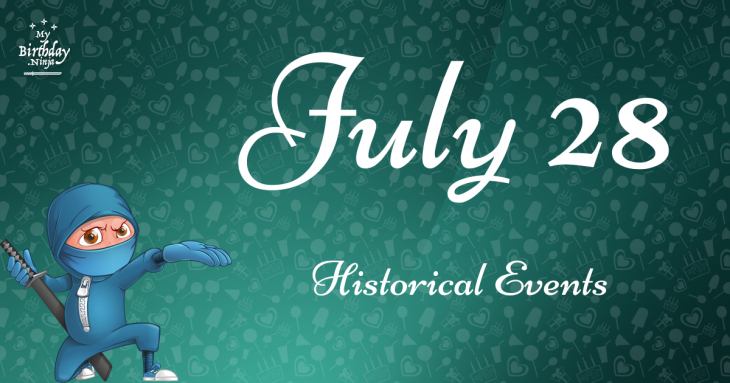 The following events took place on July 28. The list is arranged in chronological order. Found 37 events. Showing 1 - 30. La Laguna encomienda, known today as the Laguna province in the Philippines is founded by the Spaniards as one of the oldest encomiendas (provinces) in the country. USS Constellation, the last all-sail warship built by the United States Navy, is commissioned. World War II: Soviet leader Joseph Stalin issues Order No. 227. In response to alarming German advances, all those who retreat or otherwise leave their positions without orders to do so are to be tried in a military court, with punishment ranging from duty in a shtrafbat battalion, imprisonment in a Gulag, or execution. Summer Jam at Watkins Glen: Nearly 600,000 people attend a rock festival at the Watkins Glen International Raceway.